This site is located in the hills just SW of the City of San Luis Obispo. The site is located in the Laguna Lake Park operated by the City of San Luis Obispo. The entrance to the park is from Madonna Road off and west of Highway 101. You can also access Madonna Road from Los Osos Valley Road either from Los Osos or Freeway 101. Once on the entrance road of the park keep right until it ends at the parking area, restroom and dog's area. Continue on foot west along and around the hill to the southern edge of its west face. Local flyers generally kite mid way or better up the hill to launch. The site is a combination thermal/ridge site, and conditions can be quite strong. The ridge extends � mile northwest. Due to the presence of an approach control zone (SLO airport) to the south of the hill, you are restricted to 600 msl or below. The large hill (Madonna Mountain) to the Northwest is private property and flying there is not recommended as the owner frowns on trespassers. Beware that favorable conditions which allow an experience pilot to fly Madonna Mountain are rare. All pilots must have a rating of Intermediate (P-3) or higher. Novice (P-2) pilots must be accompanied by an instructor at the Site and pass the ground skill test. 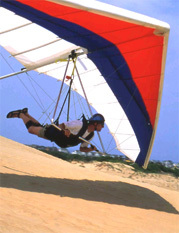 Keeping the glider above your head for two minutes. Demonstrate a successful reverse launch technique. No flying above or across the ELECTRICAL POWER LINES. A Waiver must have be signed, and on file with with the City of San Luis Obispo. This Waiver AND proof of medical and liability insurance is required by the City prior to flying this site. Before conducting flight you must check the SBP ATIS (Airport Traffic Information System) on 120.600 mhz or call (805)545-9638 to see if anyone has called in for permission to fly at Laguna Lake that day. If not, you must call ATA (Airport Tower Administration) office at (805)781-8753 and request "paragliding activities at 4 miles northwest of the airport at 600 MSL and below". This site may first appears benign but along with the thermal nature of the site, there are plenty things that can get you in trouble. The entire hill and shallow slope areas used for landing are strewn with sharp volcanic rocks and boulders sometimes hidden by vegetation. Also note that two separate barb wire fence enclosed "ecological study areas" are located in the flying area. One is located south of the normal LZ in front of launch. The other is located several hundred feet north of launch in the mid to lower portion of hill. Take note of their locations before you launch! As indicated above, stay clear of high voltage electrical power lines which are well forward of the hill/ridge. Good year round site, not great in winter but better than most. Best winds WSW to WNW 8-16 mph. Best mid to late afternoon. Strong rotor can forms off the hill-ridge to the NW of the launch area when winds are northerly.